Parlez Vous, Dolomieu? NO, it's not a French fish, even though it sounds like it might be. 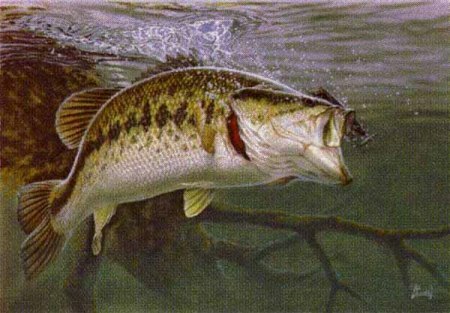 Another of the black basses, this popular gamefish shares its popularity with its well-known cousin, the Largemouth Bass. The Smallmouth is the type fish of its genus (it is the original one identified). Native to most of the fresh waters in North America, they are typically found in temperate zones where the weather is mild most of the year. Hot zones for these fish are the upper Mississippi River basin, the Saint Lawrence/Great Lakes, and the Hudson Bay Basin. Smallmouth can be found in moving or standing water. They're tricky that way, fellas. They tend to stay in cover all the time. For decades, the conventional fishing method was to use bait-casting or spin-casting gear. However, today more and more fly fishers are having a go at the Smallmouth. Smallmouth prefer the clearer, cooler water of lakes and streams, but can also be found plentifully among submerged rocks, stumps, weedbeds and the bottoms of sandy lakes and reservoirs. They are identified by a typical dark brown coloring with vertical stripes. The lower jaw is completely in front of the eyes. SPECIAL NOTE: Smallmouth are sensitive to the water quality. So if these guy and gals move out, it's a good indication of the pollution levels in that body of water. Like their big mouthed relatives, Smallmouth Bass, as adults, are carnivores, and will eat other smaller fish, crayfish, and insects. The kid's menu features yummy plankton. Like all the basses, Smallmouths are hunters and will take about anything that happens by their neck of the pond, stream, lake, or reservoir. They will hide in the submerged cover of weeds and stumps until Nemo comes bopping along, then BAM!, you won't find Nemo anymore. Usually, the major feeding frenzies take place at dawn and again at dusk. So get out there early, stay late, lie to your better half about how much beer you took along, and catch yourself some of these babies! Smallmouth Bass can be prepared in any way you like to eat fish. Bake it, broil it, bread and fry it, smoke it, kiss it (just kidding), or grill it for a special aquatic treat from Mother Nature. All you need is butter, some wine, garlic, and your favorite spice from the rack. The rest is up to you, fellow bass lovers. 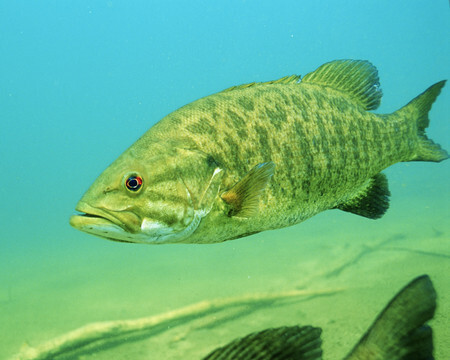 Smallmouth can resemble Largemouth to a degree except for the stripes/markings. Largemouth have horizontal ones, Smallmouth have vertical ones. They may also be mistaken for a larger perch by more, ahem, inexperienced anglers. Perch don’t really get as big as ANY bass, so if your catch is above two pounds, IT AIN'T NO PERCH!